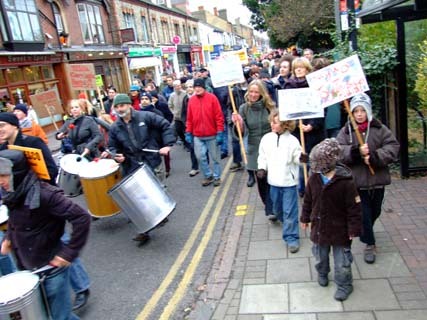 Thank you to the hundreds of you (estimates range from 250 to 800) who joined us on our hugely successful march down Mill Road on Saturday 24th November. 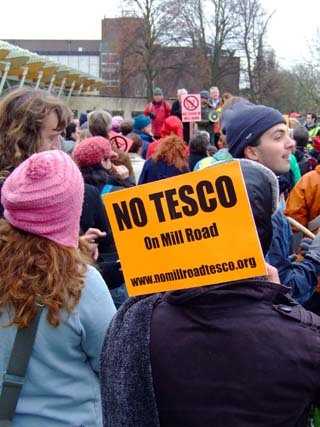 It truly was a day to remember, from gathering outside the swimming pool, listening to speeches by Councillors and messages of support from the MP, other successful anti-Tesco campaigns and local groups, to the joy of walking down our Mill Road behind a samba band! The police were a great support; they maintained a discreet presence to ensure the safety of the marchers. 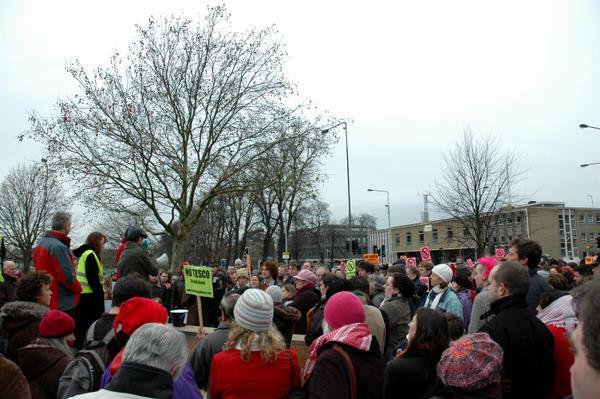 Everyone who marched behaved impeccably and (we hope!) had a great time. A short speech by Abdul Arain from Al Amin closed proceedings outside the Wilco site and everybody dispersed peacefully and quickly. Thank you in particular to the members of the samba band who lead the way with such enthusiasm, and to the people who acted as stewards. 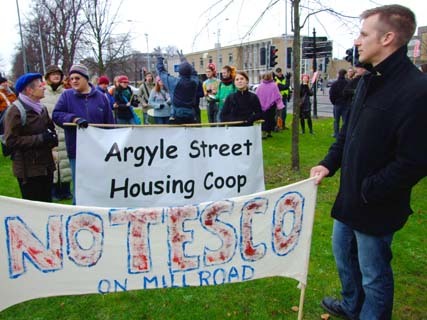 Over 4000 people have signed a petition, and a remarkable 1100 people sent in written objections to the City Council regarding Tesco’s planning applications. A poll in the local Cambridge Evening News suggests 75% of people across the city are opposed to the proposed increase in Tesco’s dominant position in Cambridge. The multinational giant already controls 51% of the grocery market here – putting us in the top 10 Tesco-dominated places in the UK. According to a recent Competition Commission report such dominance – surprise, surprise – has a negative impact on the consumer. 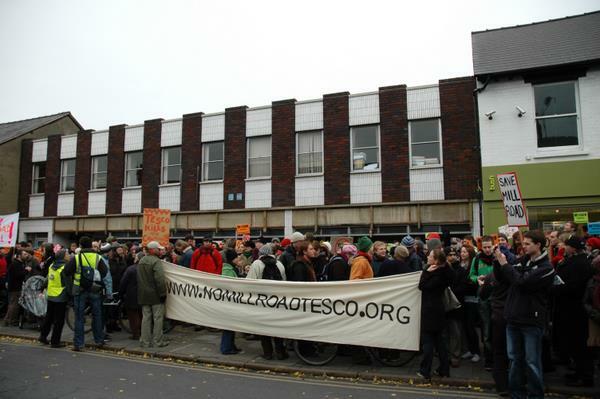 The day will have sent a very clear message to Tesco of a community united in opposition to their proposals. 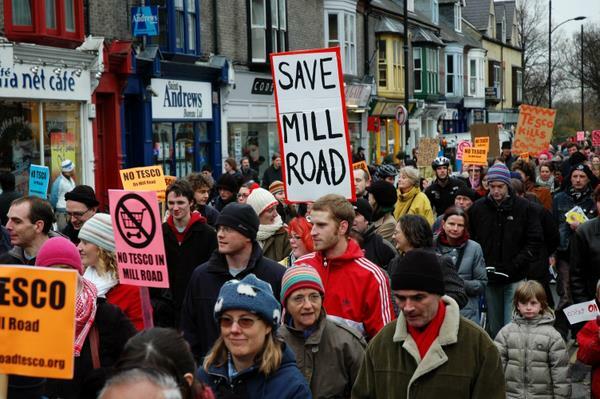 We are meeting this week on Wednesday 28th November, 6.30 at the Baptist Church Mill Road. We will mainly be discussing our plans for the Winter Fair on Saturday 1st December, but there will be a fairly brief general discussion. All are welcome so please do come along. Photos copyright respective contributors to Indymedia – thanks to them for these.